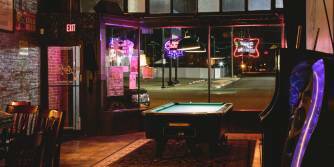 Located just a block east of downtown Wichita, the ultimate drinking hole, dive bar, hipster hangout, and live music venue. Tucked away from the crowds of Old Town but, still only a stone's throw away. Lucky's is your ultimate watering hole. A dive bar crossed with a hipster hangout, Lucky's Everyday, serves belly-up-to-the-bar conversation after work and great regional music later in the evening. A pool table, pinball machines, and a Galaga Arcade machine round out your entertainment options. We have a huge covered patio with comfortable seating and space heaters that you need to check out.